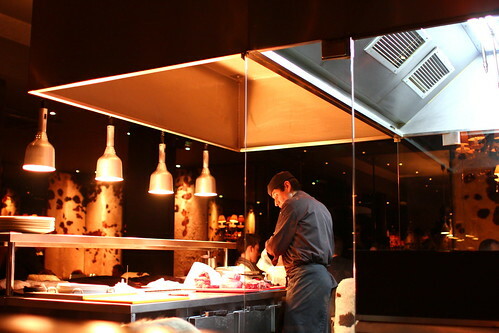 Specialized in Argentine Steak, Gaucho can be considered a well known popular joint among locals whenever they feel like quality steak at relatively reasonably price. Gaucho is a chained restaurant but definitely not those similar to Angus Steak House which is around every major intersections! 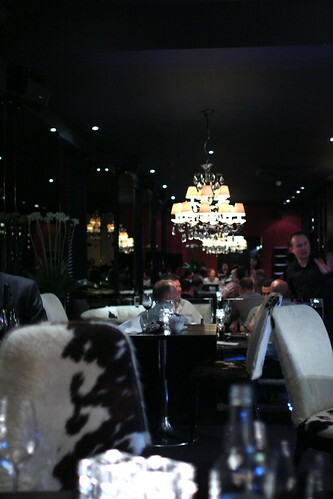 I quite enjoyed the dimmed lit interior of Gaucho (Piccadilly - London) with hanging white lights and chairs + wallpaper with black and white cow-skin patterns. We were seated at the second floor main dining room and wow it was rather noisy to be honest. I guess it was the echoes of joy and cheers. The core of the restaurant at this outlet was not the the kitchen hiding somewhere behind the walls, it was the "beef / steak" counter situated right in the middle of the dining room. I assumed that it was the Steak Specialist behind the counter, he hand picked the meat and weight it lightly by his bare hands and cut it up to confidently before using an electronic weight for confirmation. A swift 180 degree turn he put the steak onto the grill for the final touches! Argh, too bad it wasn't my steak I was looking at, I was still checking out the menu and the wonderful wine list. 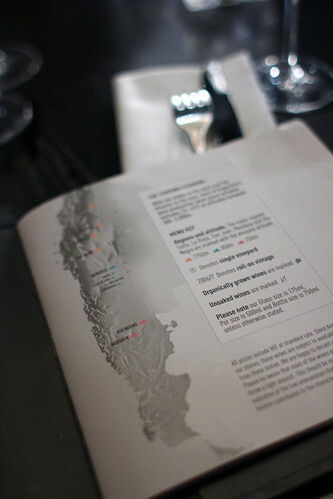 It featured a large selection of Argentina wine with detailed explanations and all sort of information regarding the wine's regions and characters. I almost wanted to take it home because the wine listed seemed more like a wine guide than a simple list. While deciding on which wine to order, the lovely Mary, oh wait her name was Martha right? 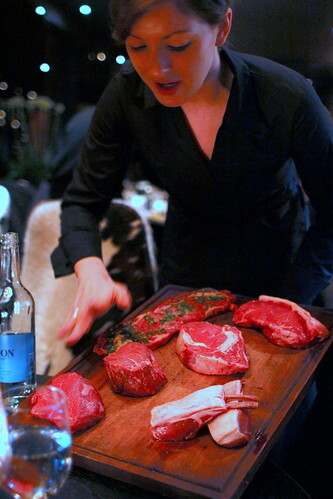 Anyhow, the lovely and friendly waitress kindly showed and explained to us the various kinds of steak on menu. 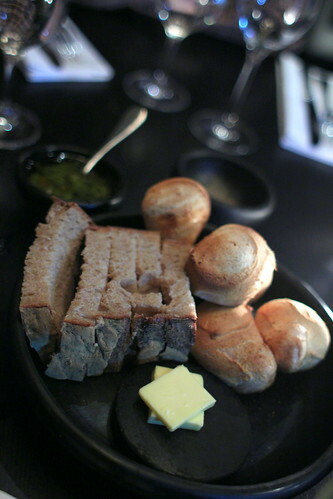 The bread basket was rather unexciting except for the cheese puffs! We ordered more because I alone ate a few already! They were warm, cheesy and chewy! Let my teeth go for a little exercise in a good way! 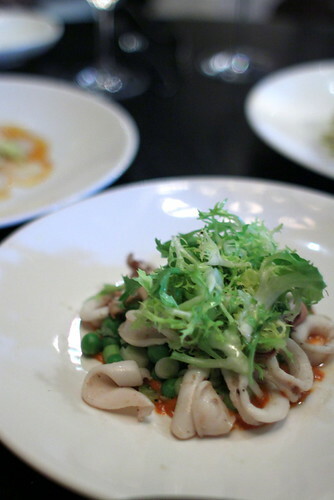 The Squid Salad Chviches was another refreshing starter.Very flavorful with a touch of jalapeño. The daily special was this scallop rather disappointing. 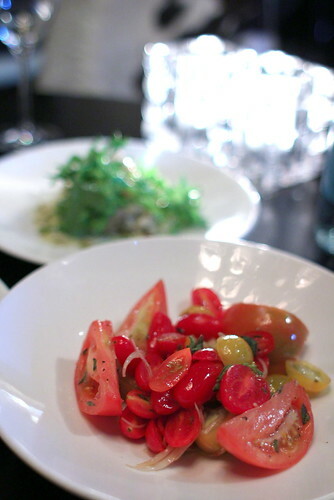 The lime flavor overtook the sweetness and freshness of the baby scallops. I think they even cut the baby scallops in half which made the texture kind of funny in a bad way. Simply put, overly lime-y and too thin. Disappointing. So how was the steak? It was fairly good indeed. 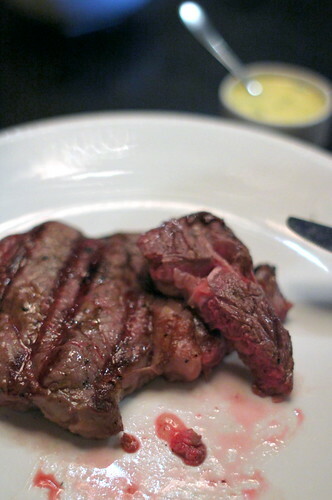 I ordered the Ribeye (Bife Ancho - 300g), medium rare as always, with Bearnaise sauce. I only tried a little of the bearnaise sauce not because it was bad, just that i prefer to have my steak just the way it was. Unlike the American style (which I assumed), the steak was served thinner. Thickness of a steak is very important in my opinion, 1 inch to 1-1/2 inch would be very common, anything thinner requires skills because it can be easily dried out if not careful. By serving thinner steak with the correct degree of done-ness, the chef here at Gaucho has proven his skills indeed. Great Decor and lovely services. Dedication of chef in preparing some good quality steak! Cheese puffs ... cheesy in a good way! 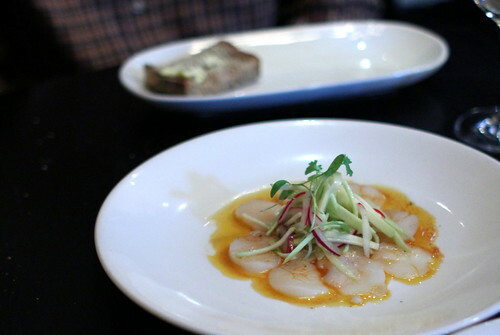 Disappointing baby scallops, lime flavors overtook the sweetness of the extraordinary thin scallops. Quite Loud and noisy, more of a business gathering venue than for intimate dinner in my opinion. Although it is a casual resto in a sense, the overall atmosphere gave me a slight sense of pretentiousness.Maybe it is just me?